Citrix looks set to lose out following Dell's $US67 billion acquisition of EMC, as the industry weighs up its options following technology’s biggest merger deal. With the wheels firmly in motion, the combination of two enterprise powerhouses looks set to impact the storage and networking industries from top to bottom, disrupting market share for both large and small players. That’s the view of Oppenheimer analyst, Ittai Kidron - when speaking with Street Insider - who believes the deal, which will maintain VMware as a publicly-traded company, could have far reaching implications for industry rivals. “Citrix could end up being the big loser if Dell/EMC take a more hands off approach to VMware,” Kidron claims. Following the announcement, VMware will continue to operate as an independent company under CEO Pat Gelsinger. Going forward however, Dell plans to take a greater economic interest in VMware, buying back shares in it over time, as confirmed by Gelsinger in a conference call with analysts. 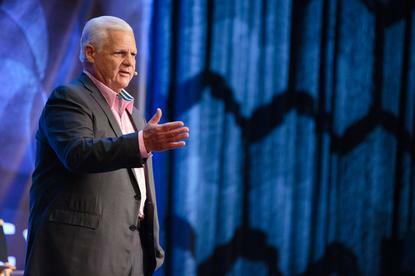 According to EMC Chairman and CEO Joe Tucci, Dell stands to benefit from a number of synergies with EMC. “It's pretty amazing how many companies Dell is the number one reseller for, and it's also amazing how many of those technologies our products can substitute for,” he adds. In the case of VMware, those revenue synergies could involve substituting Dell networking products for those of Cisco Systems, VMware's current networking partner. But, Gelsinger said, VMware expects to continue to work with Cisco on Vblocks and other VCI options. According to Kidron, when it comes to storage, Cisco now needs to “re-examine its position in storage” and possibly look to build out a portfolio of products. “Cisco, a serial acquirer has pursued a partnership strategy but that may change,” Kidron adds. “In the case of Cisco, this means acquisitions and possibly several of them. In the short term, Kidron believes the winners would be NetApp and HP’s Enterprise business as Dell and EMC begin to combine and streamline. “However, longer term, both would likely need to take steps to beef up the breadth of their datacentre product offerings,” Kidron adds. The impact on these larger vendors, according to Kidron, makes emerging storage companies more valuable and improves their ability to hire top talent. “This list includes but is not limited to: Nimble, Nutanix, Pure Storage, SimpliVity, Tegile, and Tintri,” Kidron adds.